What a fantastic resource! I am in love with http://www.realtimefarms.com/ and all that they are attached to! Use their handy website to find local food sources, food artisans, restaurants and Farmer’s Markets. I have been hoping to take my boys to visit a dairy farm and this site has been the perfect starting point. If you are interested, you can register with Real Time Farms and connect your favorite farms/markets or otherwise to the rest of the blogosphere. Pretty interesting! While on the subject of visiting dairy farms, I should talk a little about my new favorite food. 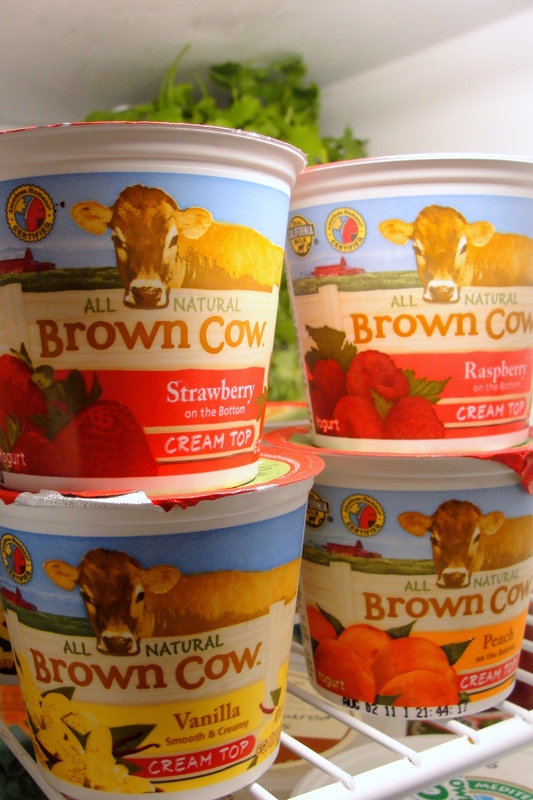 Brown Cow Yogurt. Seriously, it’s my FAVORITE food right now. This is how the Brown Cow describes itself, “We use only natural ingredients, like fresh, wholesome milk, the finest fruits, pure maple syrup, honey, real vanilla, coffee and cocoa and never any preservatives, artificial colors, artificial sweeteners or refined sugar.” I challenge you to pick up a Creme Top yogurt, check out the ingredients for yourself and give it a taste. Oh Lordy, it is amazing! Apparently, someone in the world started using the words “amazeballs” in the past year or so and yes, Brown Cow is amazeballs! I’ve stopped eating low or no fat foods after some research and trial. It’s true that fat does not make you fat. I can never, ever go back to eating the yogurt of the past. Dannon Light N’ Fit? Gag me. I really enjoyed watching videos from the Brown Cow dairy farmers (here). After hearing how well these cows are cared for and fed, you may start to wonder about the cows we don’t ever hear about. You know, feedlots, antibiotics, all that…well, crap. As I get more and more into talking about the world of dairy and how we should be slurping up the full fat milk from local, grass-fed cows, I pose a challenge. As a great first step into dairy awareness (OK, pause here to just make it known that it is REALLY hard to type dairy without constantly typing DIARY instead) check out where your milk is from! Go grab your milk, copy the code into the handy website listed above and check out the distance between cow and your fridge! I’ve found the best source of local-ish, organic milk to be Fresh & Easy. They carry Humboldt Creamery and it is pretty good!